There’s been a lot of chatter lately on organization. If I could find the blog posts I would link them here, they are lost in space. I’ll be honest. Organization is a four letter word in my house, right after housework. I am in the process of re-organizing some of it. I also don’t plan well enough for all notebooks, for the same novel/series, to be the same color. each short story gets it’s own small polyvinyl pronged folder. I discovered these when my kids were in preschool. They were a little more expensive, but my youngest couldn’t destroy them. Inside that folder I place any plotting/planning notes I have. I also include each printed copy of the SS with edits/revisions. Each edit gets a tab with the date. That way I know which edit is the most recent. A small folder should be sufficient for most SS’s. If it ends up being a temperamental story that needs to be beaten into submission, I’ll move it to a 1″ binder. I also include a page of queries listed. That way I can see where my stories have been sent. Novels are done the same way, except they go straight to a 2″ binder, or larger depending on the size of the MS. Usually, each reprint of the novel goes into a new binder. 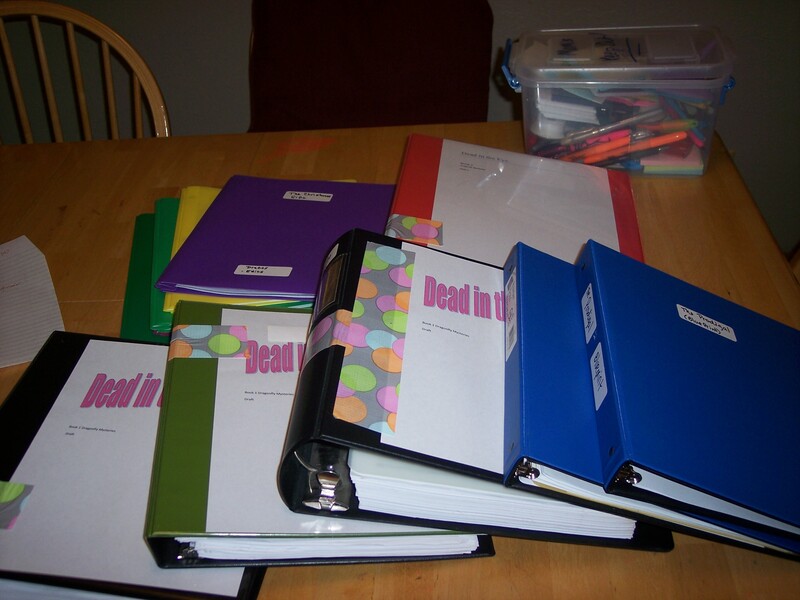 Each binder is marked with matching duct tape. I have tween girls, fashionable duct tape is in ample supply here. This is also where a little forethought would have been helpful with matching binders. Question: When do you throw away ‘older’ versions of your novel? or Do you keep every rewrite? Novel Blueprints are placed in there own binder and have the same color of duct tape as the MS binder. Confused yet? Some people call these Bibles, I like blueprints. It holds all of my planning/plotting and character sketches. Anything I might need to look back at later, is put in this binder. I use tab separators between sections and include plastic pocket pages to hold things that I can’t put a hole in. If I can figure out how to print my corkboard from Scrivener, I’d include that. Anyone know if that’s possible? Series Blueprints is a new binder that I am creating. I have two novels and one novella in a series. I just started planning the third novel. I’m just now trying to decide what exactly needs to go into this binder. I know there will be some repeats from the novel binder. Series character and story arcs, overall themes, and characters will be included. Also ideas for future books in the series. Not sure if another strip of tape on this is necessary or not. That’s where I stand now. Mountains and mountains of paper held captive in folders and binders. Now I need to get back to work. How do you organize your writing? If you have any helpful hints or blog post about it, include it in the comments below.